Mangos are the national pastime in the Caribbean. Each village passionately claims they grow the best mango and that every man, women and child has their own favorite. The locals hold the mango in reverence as if it where the key to the universe. You can tell by the way they hold the mango before they devour one. Tropical fruits are one of the defining ingredients of the Caribbean. Mango, papaya, guava, pineapple, banana, tamarind, sour orange and passion fruit are universal to tropical cooking. But the mango is king, being the most popular of all fruit and for all the right reasons as I describe in detail in my cookbook ” The Great Mango Book”. 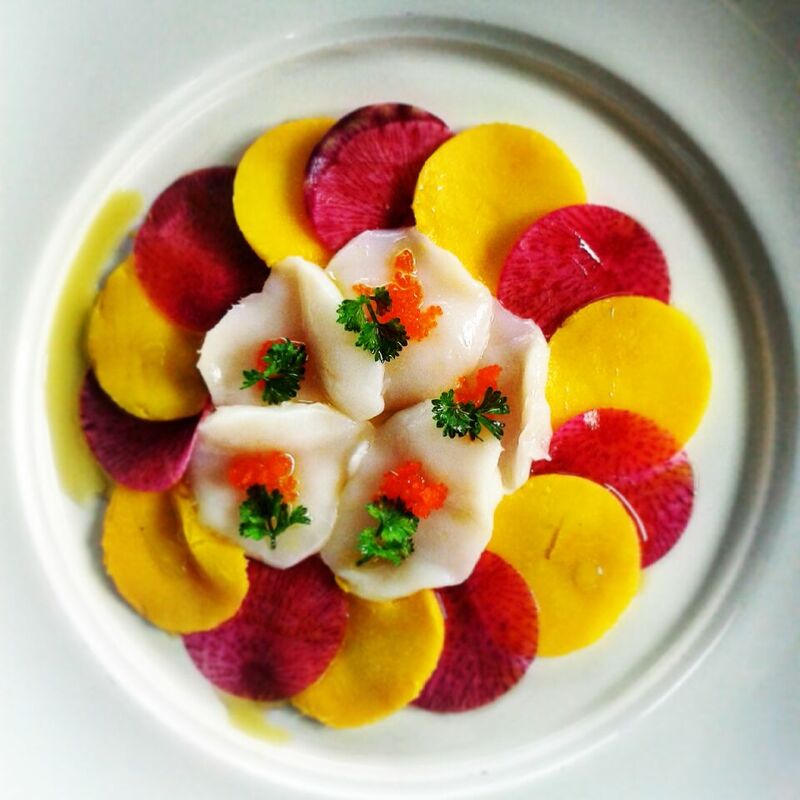 The mango has melted into the cuisines, cultures and hearts of the people. The species name of the mango is Mangeferi indica, which means “an Indian plant bearing mangos”. It is thought to have originated nearly 4000 years ago in the Hindo Berma region. Spanish and Portuguese explorers of the 15th century brought mangos to the Caribbean. Mangos seemed to island hop by themselves, finding fertile soil and warm tropical climate, making their home in the Caribbean. The mango has naturalized itself to almost every island and is particularly widespread in Jamaica, Cuba, Haiti, Puerto Rico, St Lucia, Martinique and Trinidad – Tobago. Often their names reflect the heritage of the fruit such as Julie, Graham and East Indian. Many of these original mango fruits gave seed to local varietals such as mango Rose, Long, Coco-bef, Mangotine, Prieto, Toledo and Madame. 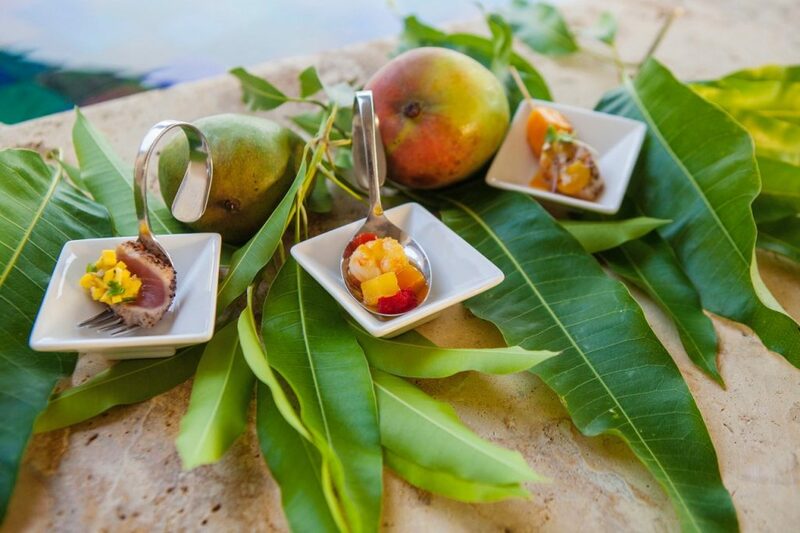 For Caribbean’s the mango is a comfort food, one of those comestibles that nourish both body and soul. Its popularity can be felt in every aspect of local life and culture. The mango motif is used in textiles, paintings, jewelry as an everlasting sign of desire and plenty. In Jamaica at peak mango season, islanders proudly exclaim “turn down the pots!”, with the loads of mangos no one need cook at home in the heat of the summer night. A mango tree represents abundance, giving, and community. When the mango tree fruit ripen the yield is amazing. Frequently hundreds of mangos are ripe for harvest, in early to mid summer. At first only 3- 4 fruit ripen, and these are held preciously. Then within a few days there are 3 – 4 dozen ripening mangos ready for picking, eating and sharing. In the full of season a family can pick 50 – 60 colorful mango on any given morning. Thankfully this abundance must be shared fresh or pickled as it is called souscaille in Martinique or cooked into batches in many home kitchens of jams or chutneys to preserve the summer time ambrosia. Of course you need to watch for the neighboring kids who also feel that they have rights too, grabbing a few of these succulent lush oval orbs to snack on. First of all it is important to understand the mango as a fruit. There are over 100 different varieties in the Caribbean. Each mango has a different color, name, aroma, texture and flavor. Our world of mango eating is made up of both delicious mature green and ripe fruits. Green mango refers to the stage of a fruit’s ripeness, not necessarily the skin color. The green mango is crisp, crunchy and mildly tart. Tree ripening allows the mango to develop to its fullest sweet vivid tropical ambrosia. 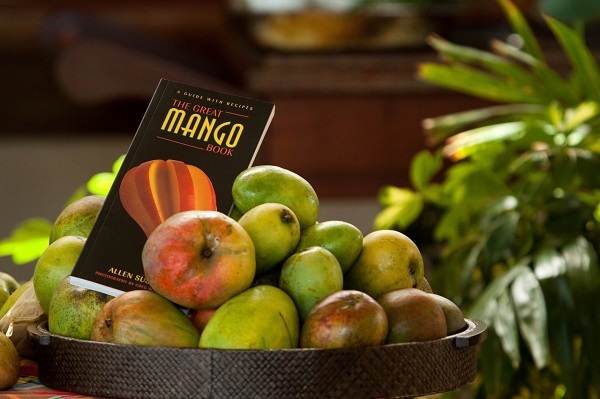 Mangos are brushed with a tropical rainbow of color. The skin pigment is more of a beauty contest than a quality factor. The skin of mature mangos are usually dull and matted. As the mango ripens and sweetens its skin color becomes more spectacular. Pale greens turn to sunset yellows, blush pinks to deep purple, multi colors turn striking red blush and crimson with bright yellow backgrounds. 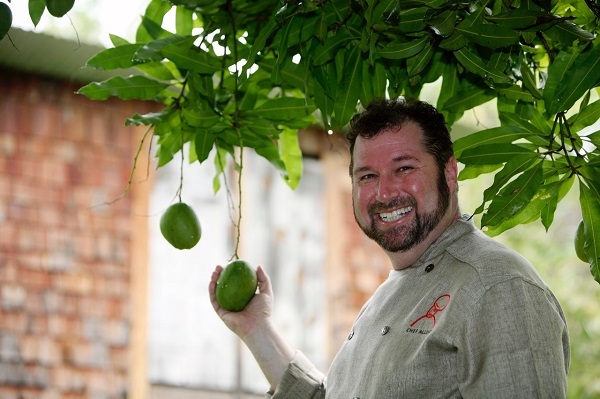 Caribbean cooks use mangos regularly, keeping it simple and delicious. The fruit can absorb spice, heat and fire with no loss of character, making it a natural for grilled fresh local fish. While at the same time the fruit can be icy and refreshing in sorbet or mango rum calada. When cooking with mango it is important recognize the contrast that sweet and tart fruit offers when pairing with the other fresh ingredients. Cinnamon, coriander seeds, black pepper, clove, vanilla, cardamom, ginger and turmeric all marry well with mango in aromatic harmony. Use the mango’s natural fruity characteristics to bring vibrant flavor to your cooking. How do you pick a perfect mango? Mangos can be large or small, green yellow or gold, sweet or tart. Mangos are consumed both mature green and ripe. Both are delicious but each have their different uses. So it is actually more important to ask- perfect for what use? For salad, dessert, marinate, rice, salsa, chutney, slaw, cobbler, ice cream, martini or mojito or fresh out of hand. Mature green mangos are eaten differently throughout the world. In Trinidad they are often pickled or cooked into a sublime, spicy chutney condiment. In Cuba, the green mangos are enjoyed fresh with a squeeze of lime and a dash of salt. To select the green mango, look for fruit heavy for its size, firm without soft spots, and should have a slight sweet – tart tropical scent. The ripe mango has a characteristic lush flavor that is sumptuous. Ripe, Graham mangos with little to no fiber are often eaten slightly chilled and peeled for a simple breakfast treat in St Lucia. On the other hand Mango Chow is ubiquitous in the Caribbean, a sort of mango salsa with green onions, hot chili peppers, cilantro and lime. Ripe fibrous mangos are juiced for their rich fragrant pulp. In Jamaica it is poured over shaved ice dramatically called sky juice, and in Latin juice bars blended into refreshing mango batidos. A ripe mango should be blemish free, with brightly colored skin tones. The flesh should give slightly to a firm squeeze and there should be the sweet scent of tropical ambrosia emanating from the whole fruit. My favorite Caribbean mango is the Julie. Probably one the best and sweetest mangos that I have ever tasted came from a very old Julie tree on the Anse Mamin plantation in St Lucia. That Julie mango, had a deep floral aroma with a pleasurable balance of pineapple and peach taste with notes of candied orange peel and a slight hint of cinnamon. Its succulence made the mango unforgettable.